Thank you for your card with we received just before our wedding on 13th October. We had a really wonderful day and week away. Charles is a truly wonderful gentleman. We are going back to Northern Ireland for most of December. Everything worked out good for us. Charles’ family and friends did everything for us, we had nothing to worry about at all. What can I say? THANK YOU for sending me Charles’ profile. I had no idea it would all come to this. Now here is my story. Some years ago (I can’t remember how many) I saw an advertisement in the Readers Digest for friendsfirst. I decided to join and hoped and prayed I’d find Mr Right. I thought he’d come straight away but that was not to be (and as you know that’s another long story). I lost heart many times but Katharine continued to encourage me and I kept going until I finally met Charles. He was so right in so many ways. He was very lonely as I was. He was glad to travel to Northern Ireland where has family too. 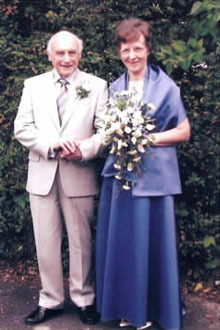 We were married in Charles Baptist Church in Chislehurst after only about 3 months. Charles’ family did everything for us in planning our wedding to which his friends came to see us. We had a wonderful day with all the support of everyone. We had about 50 family and friends afterwards to the Brokly Manor Hotel. We had a really wonderful day. We’ve quickly settled into married routine. I do hope whoever reads this will be encouraged to keep going, don’t give up too easily, don’t let disappointment stop you as suddenly you will meet a special person. With many thanks, Margaret.